Peter Paul Rubens (1577–1640) and Jan Brueghel the Elder (1568–1625), The Feast of Achelous (c 1615), oil on panel, 108 × 163.8 cm, Metropolitan Museum of Art, New York, NY. Wikimedia Commons. At the end of the Calydonian boar hunt, what should have been an occasion for rejoicing was marred when the two sons of Thestius objected to Meleager giving Atalanta the prize, and the enraged Meleager ran them both through with his sword. This leads Ovid on to detail the death of Meleager, following which he embarks on a series of stories told at a feast hosted by Achelous, a river god. When Meleager’s mother Althaea first hears of his success in killing the boar, she gives thanks to the gods. She then learns that he has killed her two brothers, and is plunged into profound grief, and anger at her son. She determines to avenge the deaths of her brothers, and recalls that when Meleager was born, the Fates gave her a burning log which they said would determine the life of her child: so long as the log remained, and was not consumed by fire, he would live. As soon as the Fates had gone, Althaea took the log from the fire, extinguished its flame, and kept it in a safe place, so preserving her son’s life. scorching with secret fire his forfeit life. and sent them winging through the lucent air. Thus two of Meleager’s sisters were transformed into birds, most probably guinea hens. Ovid then moves on to the next set of stories, which take place during Theseus’ journey home after the boar hunt. It has been raining very heavily and the rivers are swollen when he reaches the River Achelous, whose river god invites Theseus to pause in his home until his waters have fallen. Theseus accepts this invitation, and is taken to a hut made of pumice and volcanic tufa, with a damp and mossy floor, and a ceiling decorated with conch and murex shells. There Achelous hosts a banquet, his guests being Theseus, Ixion’s son, Lelex, and others, who recline on couches as they feast. Theseus looks out and sees an island which he does not recognise. Achelous informs him that it is actually five islands, the Echinades. They had been five nymphs, who had sacrificed ten bullocks to the gods, but forgot to invite Achelous. The river god raged in anger, and washed them out to sea, where they formed the islands that Theseus could see. After Achelous has told this story, Lelex starts telling the next, of Philemon and Baucis – one of Ovid’s most touching myths, which doesn’t appear in any other source. The death of Meleager is another myth which has failed to become popular among painters, although there is a superb relief on a marble panel from a Roman sarcophagus from about 160 CE. Unknown Artist, Death of Meleager (c 160 CE), marble panel of a Roman sarcophagus, 72 x 206 cm, Musée du Louvre, Paris. Image by Mbzt, via Wikimedia Commons. This relief shows the Death of Meleager using multiplex narrative. At the right, Meleager has killed one of the sons of Thestius, and is about to kill the other. In the centre, Meleager lies on a couch, in the throes of death, his sisters beside him. At the left, Meleager’s mother Althaea throws a log or brand onto the fire to bring about her son’s death. François Boucher (1703–1770), The Death of Meleager (1727), oil, 45 x 63 cm, Musée des Beaux-Arts, Rennes, France. Image by Caroline Léna Becker, via Wikimedia Commons. 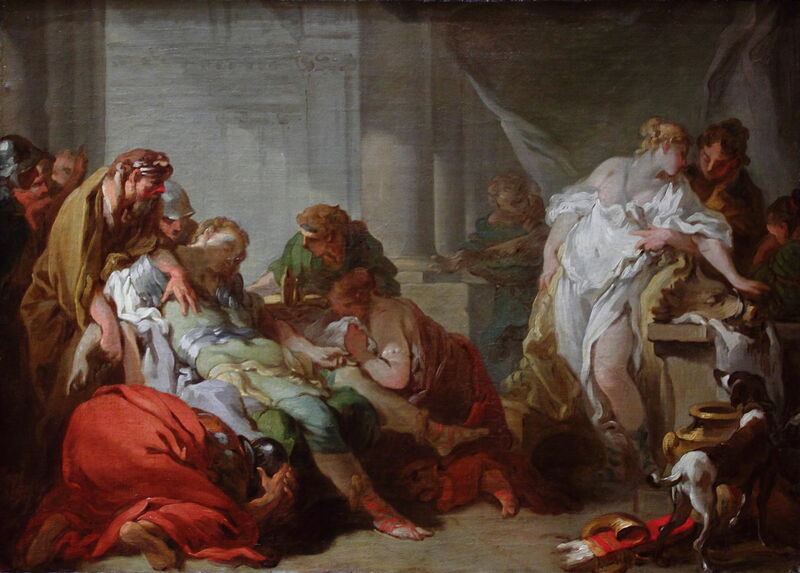 By comparison, François Boucher’s The Death of Meleager from 1727 is a little formulaic. Meleager is ailing fast on the left, his family and friends around him. One sister at the right is apparently being fondled quite inappropriately by the man behind her. Although there is a figure in the centre background who might be Althaea, there is no clear visual reference to the burning log. The feast of Achelous enjoyed a brief period of popularity during the early part of the seventeenth century, then vanished, it seems. Hendrick de Clerck (1560/1570–1630), The Banquet of Achelous (c 1610), oil on copper, 36 × 51 cm, Museo Nacional del Prado, Madrid, Spain. Wikimedia Commons. 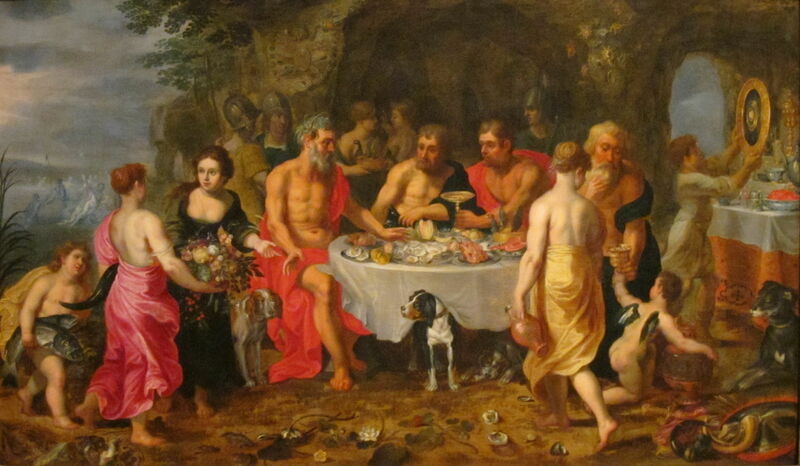 Hendrick de Clerck’s The Banquet of Achelous was probably the first of this group, painted in about 1610. The four men are feasting, sat around a table rather than reclining in Roman style. The rock pergola which surrounds them is suitably decorated with shells, and a bevy of bare-breasted young women serves seafood and fruit. In the distance, to the right, nymphs are cavorting in a bay, a delightful reference to Achelous’ story of the creation of the Echinades. Jan Brueghel the Younger (1601–1678) and Hendrick van Balen (1573–1632), The Feast of Achelous (c 1610-20), oil on canvas, dimensions not known, Dayton Art Institute, Dayton, OH. Wikimedia Commons. 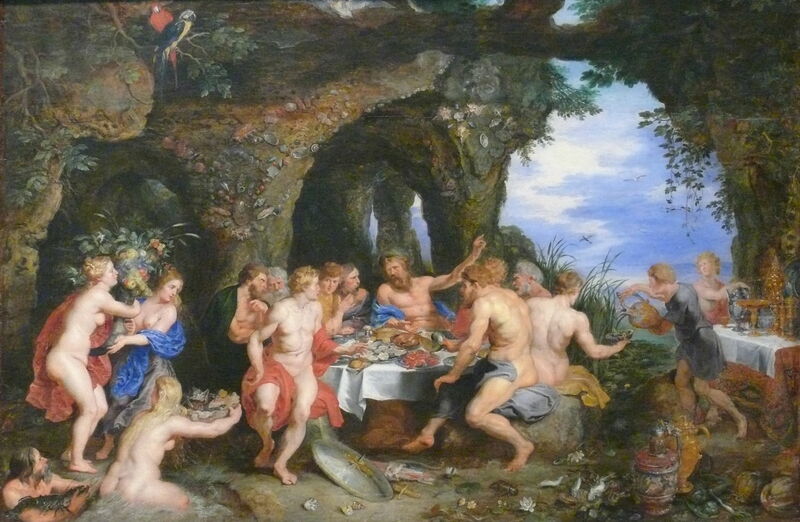 At about the same time, around 1615, Peter Paul Rubens collaborated with Jan Brueghel the Elder (father of Jan Brueghel the Younger) in The Feast of Achelous. There are now nine men around the table, and the distant nymphs are nowhere to be seen. School of Peter Paul Rubens (1577–1640), The Banquet of Achelous (c 1625), oil on panel, 73.5 × 104.5 cm, Musée de Tessé, Le Mans, France. Image by Ophelia2, via Wikimedia Commons. 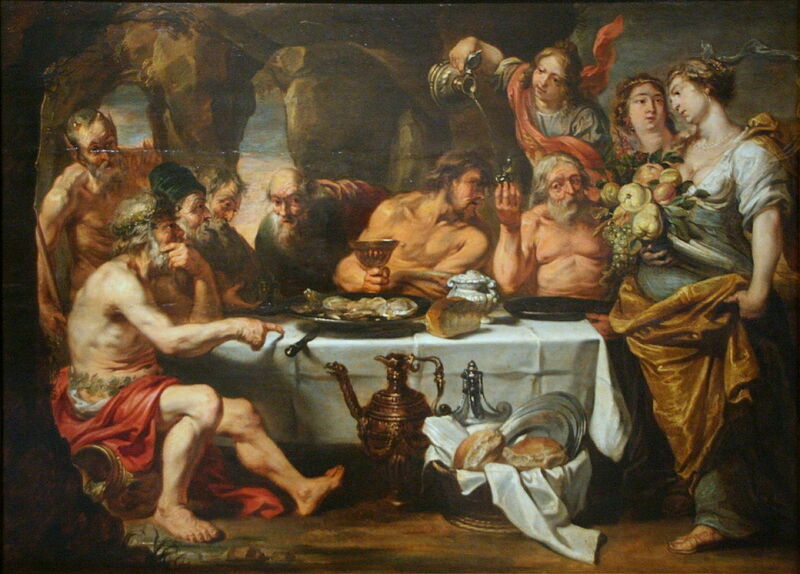 At some time during the first half of the seventeenth century, a painter from Rubens’ school made this rather less convincing and closer composition of The Banquet of Achelous. The stone hut has closed in on the group, and the distant landscape views are gone. The arrangement is reminiscent of the Last Supper or a New Testament wedding feast, with the figure of Theseus presiding – even down to a loaf of bread on the table, and wine being poured. 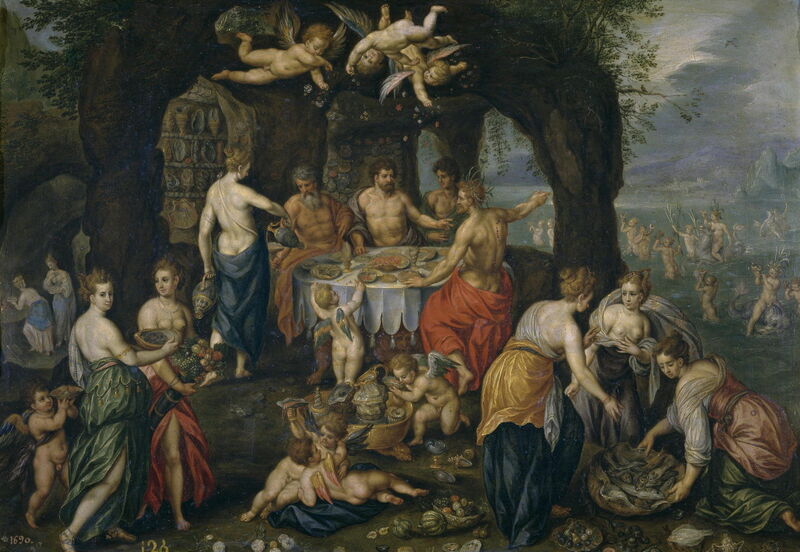 There is precious little to link this painting with Ovid’s story of the Echinades. Of the four, I like de Clerck’s the most. If it was the first, he set a standard which even the Brueghels, father and son, and Rubens found hard to match. Posted in General, Language, Life, Painting and tagged Boucher, Brueghel, de Clerck, Meleager, Metamorphoses, myth, narrative, Ovid, painting, Rubens, van Balen. Bookmark the permalink.